The other way is to increase our intake of fluoride so that there is a higher concentration of fluoride in our mouths. If there is plenty of fluoride in our mouths then the softening during the decay process is less severe and hardening is more likely. How can we get more fluoride? Fluoride is contained naturally in certain foods and drinks, for example tea and fish. It is also present in some tap and mineral water. However these sources are usually insufficient for the ideal amounts of fluoride needed to protect teeth so other ways are required. The main way that we can get enough fluoride is by using fluoride toothpaste. Most toothpaste contains fluoride but there are different strengths of fluoride in different toothpastes. You need to look for the strength by looking for a number followed by "ppm" on the packet. The ideal strengths are given below. Other ways of getting more fluoride include supplements, mouth rinses and varnishes but you should discuss with your dentist as to whether this is necessary as too much fluoride can cause marks on teeth so care is required with the dosage. Use only a smear of toothpaste containing no less than 1000ppm fluoride. Sugar-free medicines should be recommended. Use a pea-sized amount of toothpaste containing 1350 - 1500ppm fluoride. 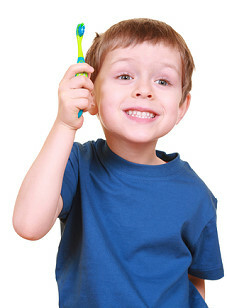 Certain children are more likely than others to develop decay and so may need more fluoride than the average. Your dentist will assess your child during the examination appointment and consider using extra fluoride sources if required. If you have any questions about this leaflet, please ask your dentist.